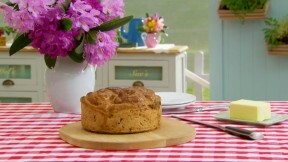 This Roquefort and walnut-filled loaf is Paul's interpretation of the signature challenge in the Bread episode of Season 1 of The Great British Baking Show. It is explained in further detail by Paul in Season 1 Masterclass: Part 2. Mix the flours in a large bowl or mixer and add the salt to one side of the bowl and the yeast to the other. Add 250ml of the water and mix with the fingers of one hand. Add as much of the rest of the water as you need to form a soft dough; rye flour takes a lot of water so you should need most or all of it. Knead for 5 to 10 minutes to a smooth dough. Add the chopped walnuts to the dough and continue kneading until they are incorporated. Place the dough in a lightly oiled bowl, cover with cling film and leave to rise for 1 – 2 hours, until at least doubled or trebled in size. Turn the dough onto a lightly floured surface and knock it back by pushing down on the dough with the heels of your hands, then your knuckles and fingertips, and folding the dough in on itself several times, then divide into 4 equal pieces. Flatten each piece of dough into a rectangle 8in x 3in. Place ¼ of the Roquefort along the long edge of one of the rectangles and roll up like a Swiss roll. Continue rolling until the dough is a 10in long sausage. Repeat with the remaining 3 pieces of dough and remaining Roquefort. Lightly oil a 8in spring form cake tin. Carefully coil each sausage of dough into a spiral and place them in the cake tin, like a four leaf clover. Leave to prove for a further hour. Preheat the oven to 400F. Brush with egg wash and bake in the oven for 45 - 50 minutes. Leave to cool in the tin for 10 minutes, then remove and transfer to a wire rack to cool completely.